Henderson’s Theater, Coney Island, Brooklyn, New York – Week of 6 September 1920. We know that Donna had finished a 5-week showing at B.S. Moss’ Broadway Theater on August 29th. We know she performed in that show because she was called out by name, Donna Montran, in one of the ads and in a promotion in the New York Clipper. I believe that after five weeks of solid shows, Donna took off a week before she began again at a new theater. 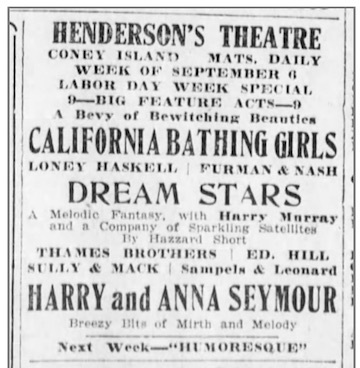 “California Bathing Girls” opened at Henderson’s Theater in Coney Island on September 6th for one week. Advertising included a short article and a small ad. The Brooklyn Daily Eagle (Brooklyn, New York), Sep 5, 1920 – Page 31 – Henderson’t Theater Ad. At Henderson’s Theater a holiday week bill will be headed by Loney Haskell, character comedian, in a monologue. “Dream Stars,” a mixture of tunes and fun, will share the headline honors. Harry Murray heads the cast and is assisted b y Gladys Joye, Bernice La Rue and Julie Steger. Other acts on the bill are the Bathing Girls, Harry and Anna Seymour, Ed Furman and Bill Nash, Sully and Mack, Ed Hill in Hattie’s Creation”: Guy J. Samuel and Lily Leonhard and the Thames Brothers complete the bill. Variety – September 10, 1920 – Page 5, Vaudeville – Column 4. Luckily, an article in Variety on September 10, confirmed it was Donna Montran in the Henderson’s production. It is confusing because the article says “Now” and she was there “Now September 10th” however, the text says July 30th and then she was apparently between gigs. 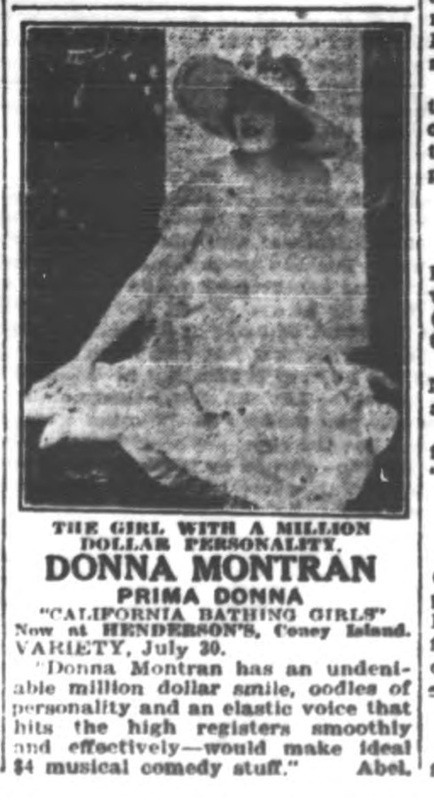 In any event, the article shows a photo of Donna sitting wearing a really beautiful hat and confirms that it was her in the California Bathing Girls at Henderson’s Coney Island. Remember that Donna played from July 26th until August 29th at the B.S. Moss’ Broadway Theater. Sometimes that show was called “Bathing Girls,” and sometimes it was called “California Bathing Girls.” However, at the same time (From August 9th until August 21st) there was another show, “Original California Bathing Girls,” playing in Philadelphia. So the question arises, was this another show or did Donna and the troupe make the 1-1/2 to 2-hour commute to Philadelphia every day. I don’t know. Certainly, it is possible. The newspaper articles I have found for the Broadway Theater engagement are clear; Donna played it. The Philadelphia engagement is not clear as it never identifies the bathing girls by name. Again, documents show that Donna played at Henderson’s Theater in Coney Island and that show was California Bathing Girls. I think more research will be needed to determine if Donna played in two shows simultaneously. Try to find further evidence if Donna played in the Original California Bathing Girls in Philadelphia from 9 until 21 August 1920 to resolve the conflict. Previous Previous post: Digitize those Photos!